Opened in 1977, the Tropical Display Dome at Brisbane Botanic Gardens Mt Coot-tha is a large geodesic (lattice) structure. It was built to display plants from the tropical regions of the world. This also includes plants that require a protected environment to thrive in Brisbane. The climate-controlled atmosphere of the dome provides the plant collection with the right atmospheric conditions. It also protects them from potential threats found in their natural environment. A circular pathway winds upwards through the dome building. It wraps around a central pond featuring water lilies (Nymphaea) and native fish. This path leads visitors past a range of aroids, calatheas, heliconia's, caladiums, palms and epiphytes. 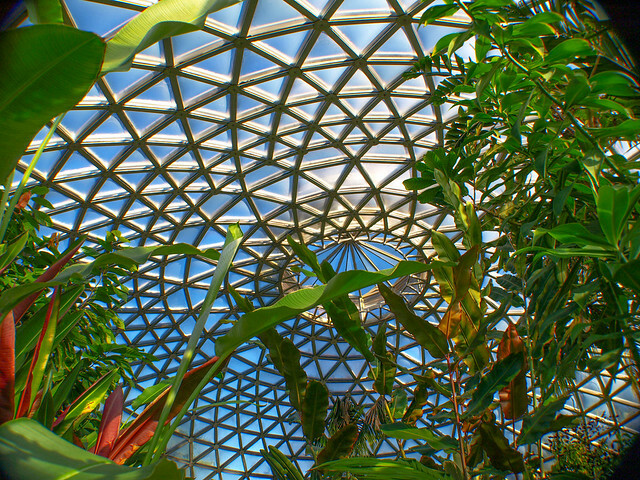 A variety of food crop plants from the tropics including Indian arrowroot, vanilla, cocoa, pepper and African nutmeg grow in the temperature controlled climate of the dome. You can visit the Tropical Display Dome between 9am-5pm daily. View the Tropical Display Dome photo gallery as a slideshow or view the photos individually in the Tropical Display Dome set in Council's Flickr account.